In recent decades, non-governmental organizations (NGOs) have begun acting as foreign agents of influence. They have organized “color revolutions” in the post-Soviet space, in North Africa and in the Middle East. The Center for Applied NonViolent Action and Strategies (CANVAS) in Serbia is thought to be the oldest of the NGOs. It trained experts to organize Milosevic’s overthrow in Yugoslavia and carry out color revolutions in Ukraine, Georgia, Kyrgyzstan and Moldova, as well as coup attempts in Belarus, Venezuela and Iran. US oversight is provided by the National Endowment for Democracy, the State Department and the US Agency for International Development (USAID); its sponsors include the US-based Freedom House. A statement by Vladimir Putin during an interview with the German TV channel ARD on April 6, 2013 indicates that Russia has experienced a massive invasion of foreign NGOs. He said that during the fourth quarter of 2012 alone Russia had 654 NGOs operating with 28.3 billion rubles in funding, and 615 million rubles of that was funneled through foreign diplomatic embassies. This suggests that the countries of the West, and especially the United States, have mobilized enormous financial resources to exert soft power pressure. To accomplish that, some 350 programs in the fields of education, culture and information have been developed to promote their model of democracy and create a class of citizens focused on US values and policies. Therefore, Washington’s operations need to be viewed in the context of NGO activities aimed at undermining the statehood of certain countries, with regime change as the goal. NGOs function as opponents of the state in Western hands. While balancing on the brink of compliance with the law and taking advantage of its imperfections, they utilize information technology in order to covertly affect people’s emotions and psychology, evangelizing ideas of Western democracy that are foreign to mass culture, moral values and market liberalism. Their goal is to bring societies they target under foreign control. 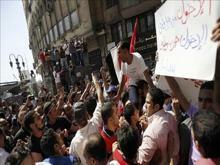 - Orient and train opposition organizations to participate in elections and challenge election results with mass protests. - Establish contacts with representatives of various government agencies needed for lobbying. - Using all crises related to socioeconomic problems for propaganda purposes and advancing populist slogans to expand the opposition’s influence among the masses. - Introducing into the mass consciousness a positive image of the “young politicians” who are critical of the current regime, and supporting radical young people. - The development of an opposition action plan to be implemented if a state of emergency is declared. All of this leads us to conclude that information network warfare waged by an opposition against a state is a war in virtual space. For the attacking side, it is primarily an attempt to gain control of a society, followed by control of critical components of the state structure, in a chaotic sociopolitical environment that it has created. At the same time, information network warfare against opposition movements is a means for the defender to prevent a conflict during its early stages. That suggests information network warfare is dual in nature. The defender’s struggle with chaos and the collapse of society are in opposition to the attacker’s efforts to employ the technology of “manageable chaos” to transition the social system into a qualitatively new state and put it on a new path. The recent events in the countries of North Africa, the Middle East and, especially, Syria can serve as clear confirmation of all this. However, the West and its henchmen are unlikely to limit themselves to those cases, because they are already preparing new operations to disrupt the foundations of statehood with the active involvement of non-governmental organizations. What countries are they aiming at? — Take a close look at yourselves! Vladimir Karyakin, Cand. Sc. (Military) is a Senior Fellow in the Department of Defense Policy of the Russian Institute for Strategic Studies. Exclusively for New Eastern Outlook. 1 Maj. Ralph Peters, “Constant conflict,” Parameters: US Army College Quarterly, Summer 1997, pp. 4-14. 2 Nadia Oweidat, at al, The Kefaya Movement. A Case Study of a Grassroots Reform Initiative. Prepared for the Office of the Secretary of Defense, Santa Monica, CA, RAND_778.pdf, 2008, p. iv.